Franklin Creek State Natural Area is located in Lee County, one mile northwest of the village of Franklin Grove and eight miles east of Dixon, just north of Illinois Route 38. The beautiful Franklin Creek flows throughout the 664-acre park. Several large natural springs, hardwood forests, bedrock outcroppings, and a large variety of flora and fauna comprise a pristine ecosystem. Pioneer families in the 1830s found the Franklin Creek area to be an inviting new home on the sometimes unfriendly prairie. Large, cool springs provided ample amounts of pure drinking water and early refrigeration; hardwood forests provided construction materials; and the creek provided fish for food and water power to run saw and grist mills. The deep, pleasant valleys protected by limestone and sandstone bluffs made ideal homesites shielded from cold winter winds. The mill spring, the largest in the park, provided water power for the largest grist mill in Lee County, constructed in 1847. Still today, many ponds and rock outcroppings along Franklin Creek carry names given to them by pioneer families. For years, the Franklin Creek has been a favorite local recreation site. In 1970, Mrs. Winifred Knox donated 100 acres of land for wildlife preservation. Through the 1970s, the Natural Land Institute purchased additional properties as they became available. Franklin Grove area citizens, wanting to see the Franklin Creek area protected, organized in 1981 to form the Franklin Creek Preservation Area Committee. Since the Committee's formation, they have gained the reputation of being the first volunteer organization in the state to improve idle, state-owned land for park purposes through volunteer efforts. The committee secured donations of money and labor, along with assistance from the Franklin Center Future Farmers of America, to construct roads, shelters, picnic tables, restrooms, run underground electric lines, drill wells, and clear hiking trails. Dedication services were held August 28, 1982, to officially open the park. In April of 1986, the State of Illinois appointed the first site superintendent to manage the new park. Picnicking: Norwegian Hill and Mill Springs Day Use Areas have two and three shelters respectively. Each shelter is complete with electricity, cooking grills, picnic tables, restrooms and drinking water. The facilities at Sunday's Shelter are totally handicapped accessible. A walk-in picnic area with parking by Sunday's Bridge offers four secluded picnic areas with picnic tables and grills. The Sunday's, Bartlett, Hausen-Knox and Banker shelters may be reserved by contacting the site superintendent. Grist Mill: The newly reconstructed Franklin Creek Grist Mill became operational in 1999. It is open to the public, initially, on weekends from April 1st to November 1st -- or anytime by appointment by calling the Grist Mill at 815-456-2718 or the park office. This very large reproduction is modeled after the original corn meal and flour producing mill built in 1847. Community volunteers, in large part, secured donations and provided the labor to complete this water-powered structure. Now the Franklin Creek Preservation Area Committee has a long-term lease to operate and maintain the facility. Along with milling demonstrations, the building serves as a visitor center for the natural area. All four levels of the Grist Mill are handicapped accessible. Hiking: Four and one-half miles of hiking trails are marked and maintained at the park. All trail markers are numbered and clearly shown on the park map to help you follow the trails. The Mill Springs Handicapped Trail is a unique, concrete-surfaced trail suitable for people of all mobility levels. The trail leads to the beautiful Mill Spring and possesses an easy rating. All other trails possess a medium difficulty rating. Pioneer Pass is highly recommended to see the park's unique, natural beauty. The three creek crossings on Pioneer Pass are wet at this time pending the construction of foot-bridges. Equestrian: The equestrian area contains six miles of trails. The Rock River Trail and Horseman Association has been instrumental in developing and maintaining this area. Equestrian facilities include a picnic shelter, restrooms, drinking water and an outdoor show arena. Equestrian, overnight, Class "C" camping is available. Snowmobiling: Four of the six miles of equestrian trails serve as snowmobile trails after the hunting season closes and a four-inch snow base exists. Cross-Country Skiing: Two of the six miles of equestrian trails serve as ski trails winding through 65 acres of rolling, wooded landscape. Trails possess a medium difficulty rating and are opened after hunting season closes. Fishing is allowed in Franklin Creek on state-owned property. Use your park map to be sure you are on park property. Franklin Creek is not stocked at the present time, but does support a population of smallmouth bass, channel catfish, carp, redhorse and rock bass. At this printing, hunting is limited to archery deer and wild turkey hunting and only allowed north of Franklin Creek in the equestrian area in season. The area consists of 180 acres of hardwoods and brushy fields. Please: This park is for all to enjoy, so help keep it clean. Put all litter in the nearest container. No plants or parts of any tree may be removed or damaged. If you have questions or need help, contact the site superintendent. Call 815-456-2878 for informatation. 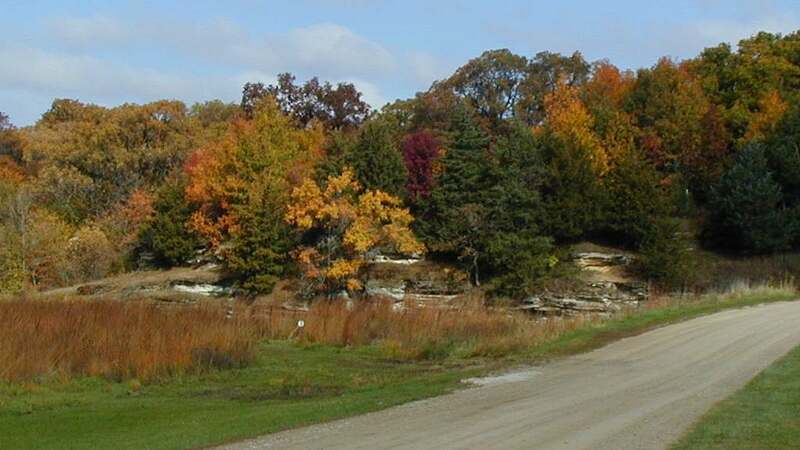 Check out the Illinois Department of Natural Resources for more information on state parks.